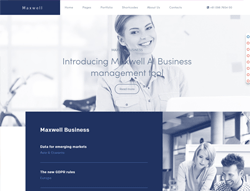 We were looking to create something unique, exciting and interesting; so we came up with Maxwell Business, a Joomla template that breaks most rules of layout design. The template is carefully crafted to ensure that the user interface and user experience blend and complement each other seamlessly. With the unlimited power of Warp framework and UIKit, Maxwell Business Joomla Template will give you more than you need to create that stunning website without the need to overload your website with numerous third party extensions.